We have an official update on the recently announced Species 1/6 Scale Sil Figure that will be released by ThreeZero. The new figure, part of their growing horror figure collection, features the full alien form of Sil from the film. They have fitted the figure with a translucent PVC skin, which will showcase the underlying skeletal structure. Sil will stand over 13″ tall and will include a stylized figure display stand. You can pre-order the Species – Sil 1/6 Scale Figure by Clicking Here. The figure is priced at $230 and should ship out in the second quarter of 2018. The price includes free shipping as well as a ThreeZero Horror Heritage T-shirt. See the official details below and all of the new photos after the jump. 1/6th scale Species Sil collectible figure is available for pre-order at www.threezerohk.com for limited time starting from now for 230USD/1790HKD with Worldwide Shipping included in the price. All Species Sil collectible figures purchased at our online store will be coming with free threezero t-shirt with threezero Horror Movie Heritage print. Please choose your preferred color and size during the purchase. 1/6th scale Species Sil Articulated Collectible Figure features Original Body Uniquely crafted to replicate the Alien Character design created by Legendary H.R. Giger for the original Species movie and Stands approximately 13.7”(~35cm) tall; Soft translucent PVC Dermis on the Torso, Arms and Legs; Strong Attention to Details including Textured Interior-Skeleton; and comes with Stylized Stand. Figure includes a Stylized Stand. 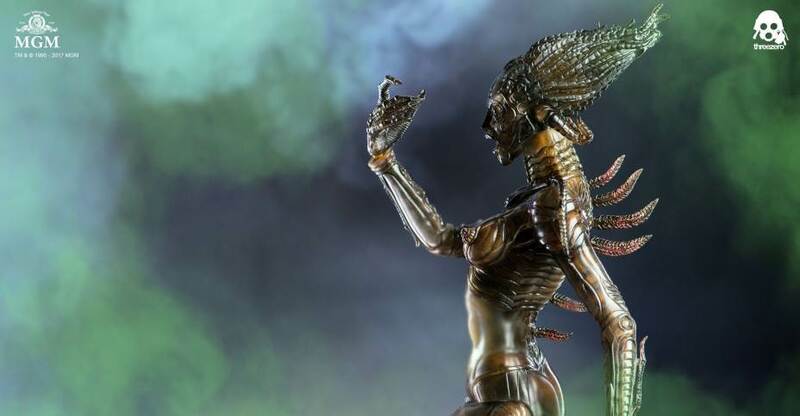 A new figure based on Sil from the cult classic sci-fi horror film Species is coming from ThreeZero. They have posted a preview photo for their Sil 1/6 Scale Figure. the upcoming release will be based on Sil’s full alien form, which was designed by legendary artist H.R. Giger. They haven’t released any details at the moment. We’ll update when more photos and info is released. You can see the full preview by clicking the banner image above. When government scientist Xavier Fitch (Ben Kingsley) intercepts a space transmission containing the genetic sequence for an alien life form, he uses it to produce “Sil” (Natasha Henstridge) — a gorgeous alien-human hybrid. As Fitch’s team grows concerned at her rapid rate of growth, Sil wrecks the laboratory and begins a violent quest for a suitable male human to impregnate her. The U.S. government dispatches top assassin Preston Lennox (Michael Madsen) and a team of experts to stop her. Hollywood Collectibles has posted images and pre-order info for two new products. 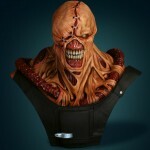 They are releasing a Resident Evil Movie – Nemesis Life Size Bust and a Species – Sil 1/4 Scale Statue. Both are extremely limited products due out in the 3rd quarter of 2013. Read on for images and more info. Please keep in mind, the Species Sil Statue can be considered NSFW (Not Safe For Work). View at your own discretion.